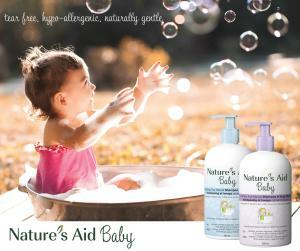 We’re excited to introduce Nature’s Aid Baby!! When it comes to your baby only the best will do. We know this because we’re parents too. And that’s why we wanted to create a line of all natural baby care products; products that we’re confident using on our own little ones. Our baby specific products include two true natural shampoo and body wash formulas; a calming version that is blended with lavender essential oil as well as a soothing, unscented version with chamomile. There’s also a multi-purpose baby balm. Now, you may be thinking “but, I thought your other products were gentle enough for baby?” And you’d be right, they are. But our baby specific washes are even more gentle, and they’re tear-free. These all natural baby shampoo and washes are free from parabens, sulfates, harsh chemicals and synthetics. Use them as a regular shampoo and body wash or add a few pumps to running bath water to create some nice, fun bubbles! The true natural soothing baby balm can actually be used by the whole family. It creates a wonderful, moisturizing barrier to protect the skin because it was designed to nourish as it protects. We use it for everything from diaper rash to skin irritations and eczema. It also makes a fabulous foot cream. We carefully selected each and every ingredient to ensure we created a product that was 100% natural. For example, nutrient rich aloe vera and chickweed help to gently restore damaged skin, and moisturizing Shea butter provides a protective barrier. While our original skin gel will also work wonders on diaper rash, it won’t protect against it. This balm does. It is also the product you’d want to use for severely broken or damaged skin. Another great feature of the baby balm is the scent. It just smells so fresh and clean and soothing. I really think many moms will get one balm for the nursery/diaper bag, and another for their own bedside table because it’s great for the hands too, especially for repairing winter damage (who else here is guilty of not always wearing gloves?!). As with our other products, our line of natural baby care products are also made in Canada. We can’t wait for you to give them a try!